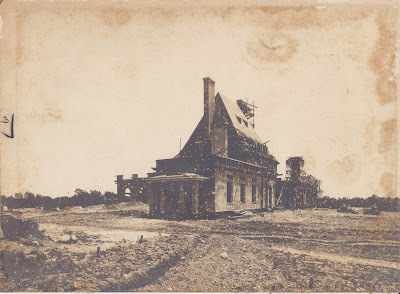 'Chateau Ivor', the Charles A. Gould estate designed by John Russell Pope c. 1908 in Dix Hills as seen in the middle of construction. Click HERE for more on 'Chateau Ivor' and HERE to see the brochure from when the estate was for sale. Photo from the Gould family collection. Very rare to see such construction photos, very nice! You couldn't pay me enough to be a roofer on this job! Great photograph but too bad there's no one at the worksite. I always like seeing the mule teams & foremen in suits & ties -- a reminder of how much was done with what we would consider today to be so little. Every time I see a photograph of this house my first thought is of a man in a stovepipe hat. It's a nice treat to see construction photos....too bad many of the other estates didn't record the building of their homes. Anon 7:36 PM -- I suspect many other estate owners did record the construction of their homes; the questions are: where are those photographs now & does whoever holds them even know what they're of?